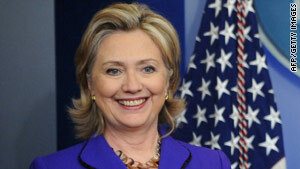 Secretary of State Hillary Clinton heads to Canada on Monday. (CNN) -- Secretary of State Hillary Clinton will head to Canada on Monday to meet with other G-8 leaders, to prepare for the Group of Eight summit in Canada in June, officials said. In addition to meeting with foreign ministers in Ottawa, Clinton will visit with U.S. Embassy staff there, according to the State Department. She also is expected to hold bilateral talks with Katsuya Okada, the Japanese foreign minister. U.S. Secretary of the Interior Ken Salazar will accompany Clinton, who also is to meet with the foreign ministers of the Arctic coastal states. Those countries, which also include Canada, Denmark/Greenland, Norway and Russia, deal with environmental and economic issues related to the Arctic. The G-8 -- made up of Canada, France, Germany, Italy, Japan, Russia, the United Kingdom and the United States -- is an informal group that meets annually to discuss major world issues. The European Union also attends the summits and is represented by the president of the European Commission and the leader of the member state holding the presidency of the EU.